A team of French researchers has demonstrated a new mass-spectrometry technology based on nanomechanical resonators that measures the mass of particles previously beyond the reach of current commercial technology, and which they used to measure the mass of a whole bacteriophage virus capsid. Current technologies for mass measurement can weigh several tons and down to a hydrogen atom mass, roughly one atomic mass unit, or Dalton (Da). In between these extremes, a gap in mass of several orders of magnitude has been unfilled: so far, no commercial technology could measure the mass of nanoscale objects in the megadalton (MDa) to gigadalton (GDa) range. Yet, this range is of great interest, as it includes most viruses, diverse biomarkers for diseases such as cancers and degenerative diseases, as well as synthetic nanoparticles for nanomedicine. Mass is a key parameter for studying, characterising or identifying particles at the nanoscale. Several Nobel prizes have acknowledged the ubiquity and power of conventional mass spectrometers. Nonetheless, these spectrometers struggle to analyse species above the MDa range, because they require ionisation to manipulate particles, and this becomes particularly difficult for “heavy” particles. The nanomechanical mass-spectrometry system demonstrated by this research team is the first to analyse particles in the MDa-to-GDa range with efficiency and high precision, and without relying on ionisation. 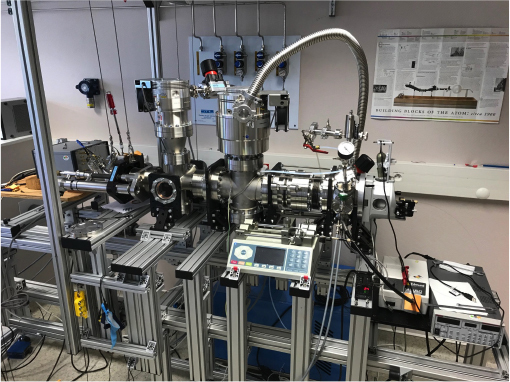 Previous attempts to realise nanomechanical mass spectrometers mimicked conventional systems and used electromagnetic processes to transport ionised analytes to the resonator. This resulted in prohibitive sample losses and analysis time, e.g. a single analysis could take weeks. Departing from conventional wisdom, the team found solutions to circumvent ionisation altogether: first, their system uses a surface acoustic wave device to nebulise nanoparticles in solution into a mist of small droplets (similar to a home humidifier), which are then aspirated into a vacuum system. Second, particles are transported and guided towards the nanomechanical detector using a flow of carrier gas that propels and focuses the particles into a very narrow beam. As this beam is still much larger (~mm2) than a nanomechanical resonator (~µm2), the team uses not one, but an array of 20 nanomechanical resonators to detect the mass of as many incoming particles as possible, one after the other. The new technology has been coined “neutral mass spectrometry” for these reasons, although it can also analyse particles whether ionised or not, as demonstrated. Bacteriophages (etymologically “bacteria eaters”) are viruses affecting bacteria. These natural predators of bacteria are of high interest to researchers, because the number of antibiotic-resistant bacteria strains has increased at an alarming rate in the past decade, while the number of new antibiotics molecules introduced on the market has decreased. Bacteriophages are considered promising alternatives to standard antibiotherapies, as they can be engineered to target specific pathogenic bacteria. However, they have not reached their full potential yet, partly because of a lack of characterisation techniques for those viruses, which cannot be analyzed in their native form by conventional mass spectrometers. The system demonstrated by the French research team may open prospects for many nanoparticles of biomedical interest, because no commercial instrument can efficiently analyse particles in the MDa-to-GDa mass range today. The research team includes scientists from CEA-Leti, the CEA Biosciences and Biotechnology Institute of Grenoble (BIG), and the Institute for Integrative Biology of the cell of Gif-sur-Yvette (I2BC).